A sobering defeat to Dublin has Galway on the back foot facing into this weekend’s Allianz Football League round three fixture against Monaghan in Inniskeen on Sunday (2pm ). A second tough away match in as many weeks against a team that produced a double-score win over Galway in last year's championship is not ideal. That first championship win over Galway by 0-16 to 0-8 sent them through to their first All-Ireland semi-final since 1988, losing to Tyrone by a point. 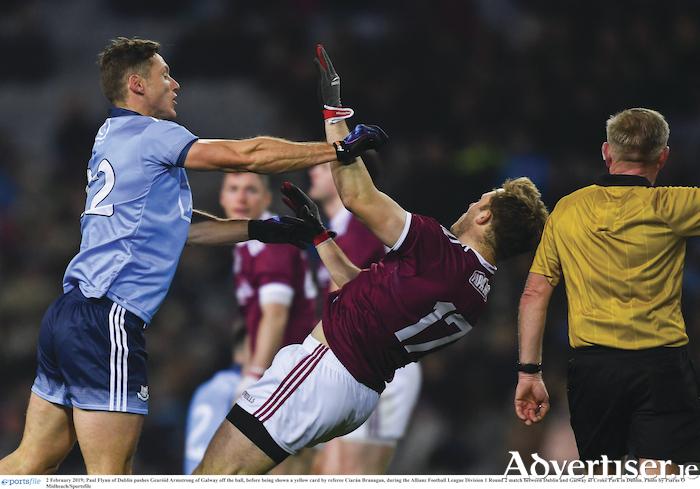 Dublin and Monaghan may well be regarded as the two best teams in the country, but a second demoralising defeat for Galway in as many weeks would be a worry. Further injuries to both Seán Andy O’Cheallaigh and Cillian McDaid will have Kevin Walsh cursing the gods, but also eager to see how his less experienced panel members cope. Last year’s superb run in the league was always going to be hard to follow, but the two heavy defeats Galway suffered in August appeared to show the players were flat when the bigger performances were needed most. Keen to avoid a repeat of this, Walsh has changed things this year and is hopeful this will show in the summer. Walsh has admitted a priority for this year is to keep players fresher than they were last year coming at the latter stages of the championship, and while still eager to stay up in division one, he is looking for the younger squad members to take their chances due to the absence of some of the more experienced players. After a shock loss to Roscommon in round two Monaghan will be eager to get back on track after defeating Dublin in the first round. A second win in the league is not yet a must, but the Tribesmen will hope to show more bite than was offered last Saturday night. They will need to because they come up against a Monaghan outfit, which having seen off Dublin in the first round, will now be desperate to get on track after their shock 1-12 to 0-13 loss to Roscommon. The All Ireland champions ensured they bounced back from that defeat to Roscommon when they finished comfortable winners by 1-15 to 0-7 over Galway in Croke Park on Saturday. Walsh's men competed well in the first half and forced Dublin into uncharacteristic wides, but they were very flat for the second half. Their lack of scores in that half, two points in total, illustrated the loss of intensity, while the Dubs kicked on. Walsh will be content in having given several players their league debut under lights in Croke Park - by comparison Dublin were able to bring on experienced players such as Paul Flynn and Jack McCaffrey to see snuff out any possible comeback from Galway. Starting well, Galway managed to stay ahead for most of the first half, forcing poor and sometimes wild shots from the Dublin players. Padraic Cunningham did well to manufacture a goal chance with little or no space, but was unlucky with his finish. Going in one point down at half-time gave the players hope that they could push on, but it never materialised. Dublin showed their experience by pressing higher up the field and cutting out Galway’s attempts to build an attack. They were well ahead and in total control before Dean Rock scored the goal to kill the tie, outscoring Galway by 1-9 to just two points in the second half. Scorers for Dublin: D Rock 1-5 (0-3f ), C Costello 0-6 (0-1m ), P Mannion 0-2, S Bugler and N Scully (0-1m ) 0-1 each. Scorers for Galway: P Cooke and C McDaid 0-2 each, J Heaney, S Walsh (0-1f ) and B McHugh (0-1f ) 0-1 each. DUBLIN: S Cluxton; E Murchan, P McMahon, J Cooper; J Small, C O’Sullivan, J McCaffrey; B Fenton (0-2 ), J McCarthy; N Scully, C Kilkenny, B Howard (0-1 ); D Rock, P Mannion, C O’Callaghan. Subs: M Fitzsimons for O’Sullivan (28 ), C Costello for Scully (44 ), K McManamon for Rock (56 ), MD MacAuley for Murchan (57 ), D Daly for Small (66 ), P Flynn for McCaffrey (68 ). GALWAY: R Lavelle; D Kyne, SA O Ceallaigh, E Kerin; C Sweeney, G Bradshaw, S Kelly; C Duggan, T Flynn (0-1 ); E Brannigan, S Walsh, J Heaney; S Armstrong, D Comer (1-1 ), I Burke. Subs: M Daly for Armstrong, P Cooke for Brannigan, G O’Donnell for Sweeney, A Varley for Heaney, K Molloy for Kerin, J Duane for Bradshaw. On a side note, after last year's uproar involving club and college when Kieran Molloy and Liam Silke were expected to be in two places at once, there is another possible fixture clash. The Sigerson semi-finals are fixed for Mallow in Cork on the same day Corofin play their All-Ireland semi final against Gaoth Dobhair. Molloy’s NUIG play Ulster University and Silke’s UCD play DCU on Wednesday evening to see if this possible fixture clash becomes a reality.